Today 15-minute one pan meal-kit provider Gobble announced its $15 million Series B investment, bringing their total investment to more than $25 million. Trinity was proud to lead the Series A and to continue to support the company through our participation in the Series B.
Meal-kit companies have become a popular punching bag for Wall Street and business media — and for good reason. Blue Apron has struggled to make the economics of its business work, while Amazon recognizes the sizable market potential and is thus entering the space. What makes Gobble a recipe for success where others have struggled, and what competitive differentiators does Gobble possess that will enable it to thrive amidst the competition? Despite the name, not all meal-kit providers actually provide the same product. Gobble’s kits are fully prepped. Food arrives already portioned and chopped, complete with easy-to-follow three step instructions that allow busy parents (and their kids!) to create fresh meals in only 15 minutes — using one pan and no mess. Not only does dinner go from refrigerator to table in 15 minutes; the cleanup is fast, too. By contrast, other meal-kit companies require you to chop and prep all the food. They only save you from looking up recipes and going to the grocery store — the rest is up to you. Cooking from scratch with traditional meal-kit companies can take 40 minutes or longer, and cleanup is an additional hassle. 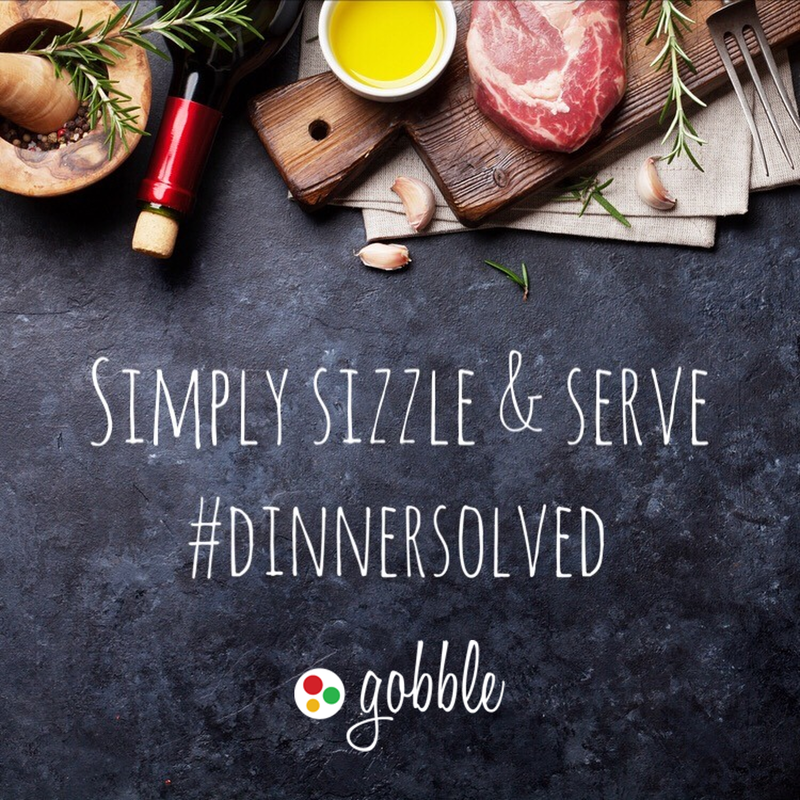 Gobble seeks to help families make dinnertime special again. Today’s busy parents have little precious quality time with their families. For many parents, being able to carve out the time to prepare fresh, healthy, interesting meals during the week is a pipe-dream at best. Gobble’s leadership understands and empathizes with their demographic. Every element of Gobble’s product — from the branding and messaging, to the menus (created by a celebrated Michelin-trained chef), to the ordering experience (which includes personalized menus based on dietary restrictions and taste preferences), to the convenience of the kits themselves — is designed to meet the specific needs of their core demographic. Most meal-kit companies must invest heavily in customer acquisition. 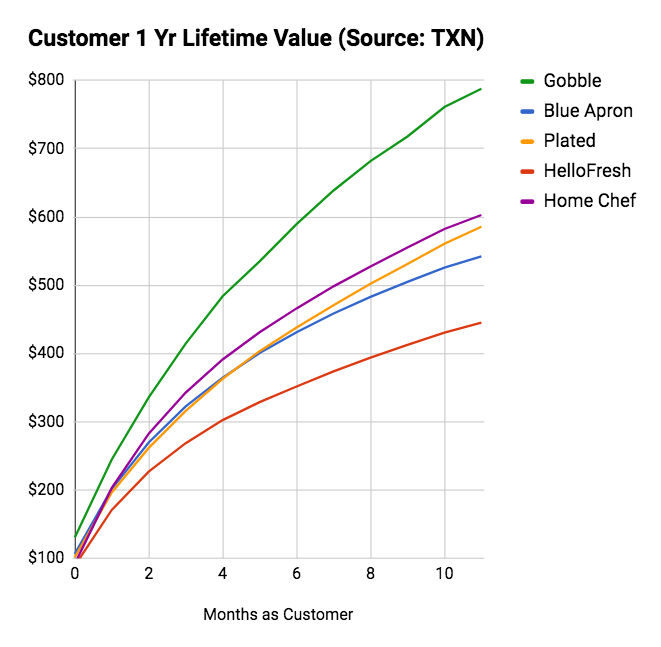 In fact, Blue Apron was spending more than $400 to acquire every new customer. Gobble, meanwhile, has acquired most of its members through positive word-of-mouth and cost-effective marketing partnerships. Furthermore, unlike many millennials who have unpredictable schedules, tend to dine out often, and enjoy experimenting with new products, busy parents are grateful to find a convenient, cost-effective, and tasty recurring solution to their weekday dinnertime needs. As a busy parent, when you find something that works, you stick with it. Due both to their low customer acquisition costs and their long-term customer loyalty, Gobble’s unit economics work well, as the chart below reflects. Ooshma Garg is a perfectionist CEO. In what is a massively complex business — from the inherent logistics challenges of prepping and shipping fresh produce, to the challenge of designing interesting, delicious meals for every taste and dietary preference, to the aforementioned unit economics challenges — Ooshma oversees every detail. Gobble’s recent national expansion has already achieved break-even or better at their distribution facilities, and Ooshma is methodically driving her company to sustained profitability. I’ve long been a fan of Gobble’s delicious meals, as I explained when we announced our Series A investment in the firm, and I highly encourage others to check out this service. Not all successful restaurant chains are the same, nor are meal kits. Gobble’s unique attributes make it a recipe for success. Congratulations to Ooshma and the Gobble team. We expect you will continue cooking up great things!